It looks like BobCostas.com has expired, and if the domain name is not renewed within the designated redemption period, the domain name will be sold to the high bidder. 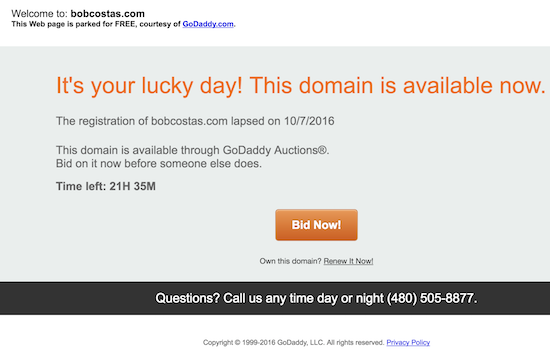 The domain name is currently registered at GoDaddy, and the domain name is set to be auctioned via GoDaddy Auctions as a result of it not being renewed upon expiration. As you probably know, Bob Costas is a well known American sportscaster who announces baseball games, the Olympics, and is involved in a myriad of other sports announcing and presenting work. Because Costas is so well-known, I think it would be difficult for someone use the domain name without legal risk (I am not a legal expert though!). I checked a few entries on Archive.org, and it does not appear that BobCostas.com was ever developed into a website. Based on a historical Whois search at DomainTools, it looks like an entity affiliated with Costas (WMEIMG) was the registrant of the domain name. The domain name was created in October of 1996, making it over 20 years old. As of right now, there is only one bid on the domain name at the minimum auction bid price. If the domain name is not renewed prior to the completion of the auction, my guess is that others will place bids even though owning this domain name is not likely a good idea. Hopefully one of Mr. Costas’ agents or representatives will see that BobCostas.com expired and renew the domain name before the redemption period ends. I would imagine this is one of the benefits of the GoDaddy Auction platform in that an auctioned domain name can still be renewed by the former registrant up to a week after the conclusion of the auction. It might be frustrating for a winning bidder, but it would likely be helpful to a registrant who belatedly learns about its expired domain name. I don’t actually buy or sell domain name but i wouldn’t buy it either. I don’t want to spend money on domain name which has a person’s name inside it. I don’t see much profit for future for such domain names,IMHO. Really? What are you doing here then and how did you get here? I’m not even primarily a seller myself, but if you’re not a buyer or seller of domains then what are you doing here? I assume your comment is sarcastic, so why is this GoDaddy’s fault? They could not possibly have the resources to determine whether or not a domain name was intentionally not renewed. It is not GoDaddy’s responsibility (or any other registrar’s for that matter) to arbitrarily renew domain names their clients let expire. They send many renewal email notices and it is the domain registrant’s responsibility to renew (or not). Anyone remember when MicheleObama.com was bought on GD Auctions? It would be smart for Bob to pick up the name, but a lot of “celebrities” don’t care about managing their own site. With that search volume it would be an easy for domain a domainer to monetize. Great value assuming you get it for a low bid.